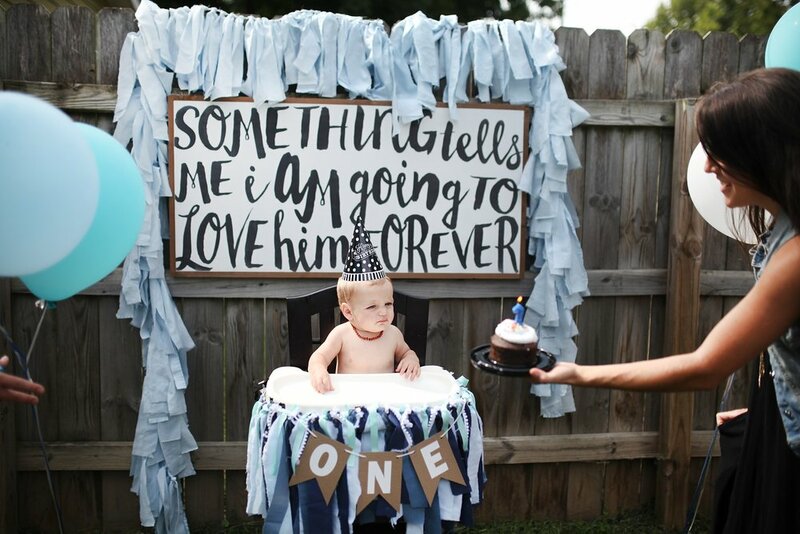 Yesterday, our darling boy turned ONE! 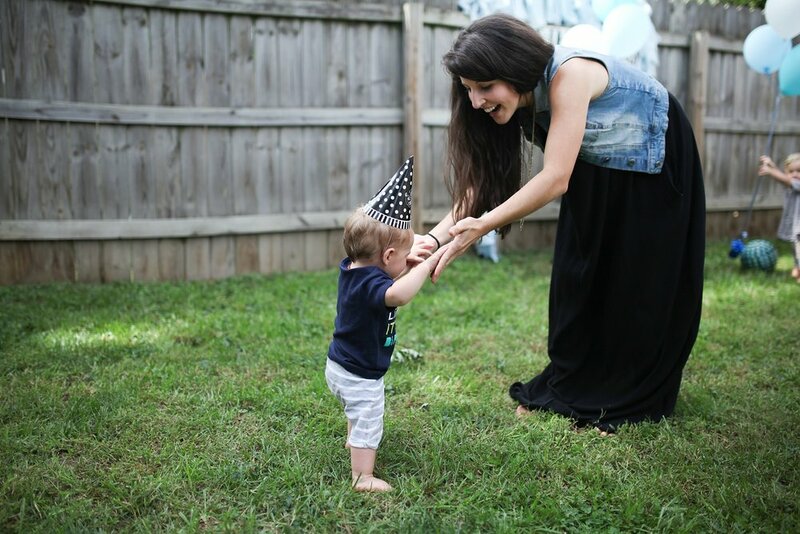 It seems surreal that I have a one year old and that toddlerhood is upon is. TIME GOES SO FAST. 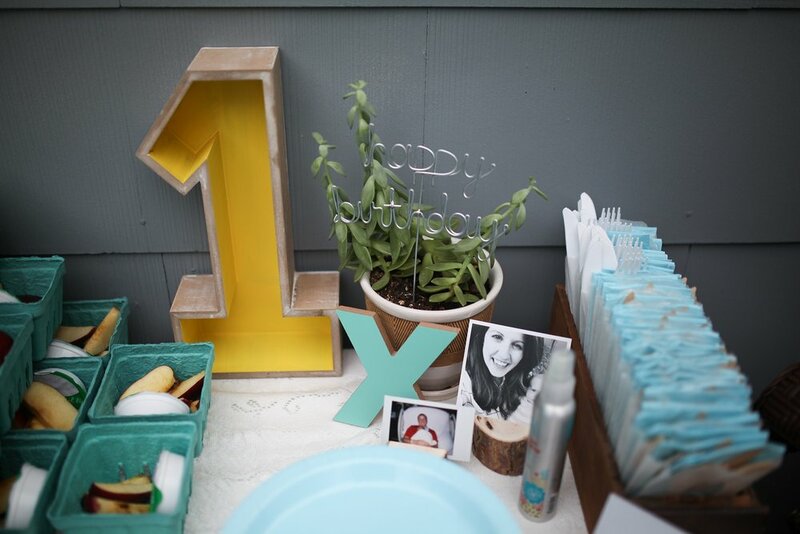 To celebrate, we threw a backyard party and invited lots of family and friends. The weather was perfect (although a bit hot - I was hoping for cooler fall weather!) and so many people came to celebrate our boy. 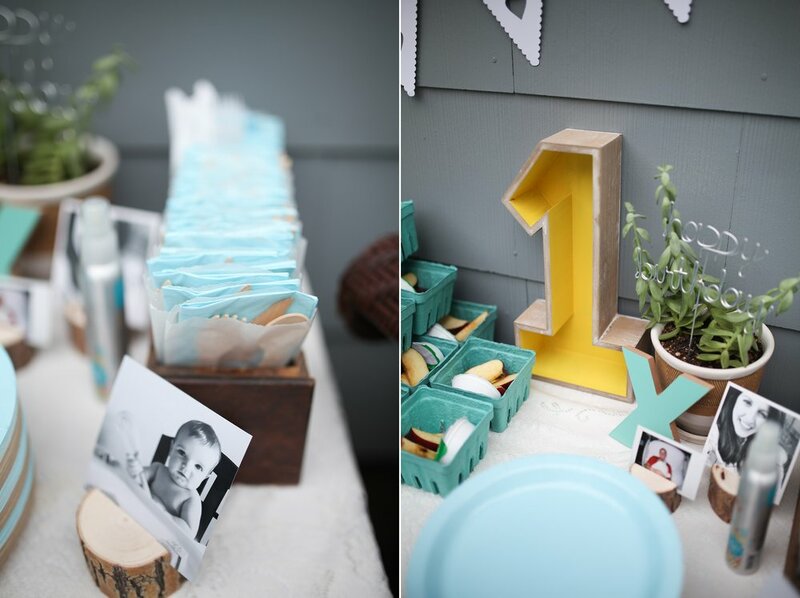 I didn't really have a theme, but used lots of shades of blue to match his invitations. I will forever think of Xavier when I see the color blue, because of his big blue eyes and how much they sparkle when he wears blue! I'll try and cover as much of the decor and planning as possible. But first - photos! Duh. Huge thanks to my pal Tessa Tillett for snapping these for us. I'll treasure them forever! I opted for decor I can hopefully re-use again. Hashtag minimalism. I started buying and creating the decorations 2 months or so before the party. Maybe that sounds ridiculous, but I LOVE to throw parties. It truly fires me up and I love being creative and finding all the right things to pull together. If that's not your jam, don't do it! But I personally enjoy it. The garland above the high chair and the high chair skirt were made from thrift store sheets, pillowcases and tablecloths that I picked up for a couple bucks each. There's a million tutorials for these types of garlands on Pinterest. Basically you cut material into strips and tie it to a piece of string. Easy! And I can reuse them in the future! 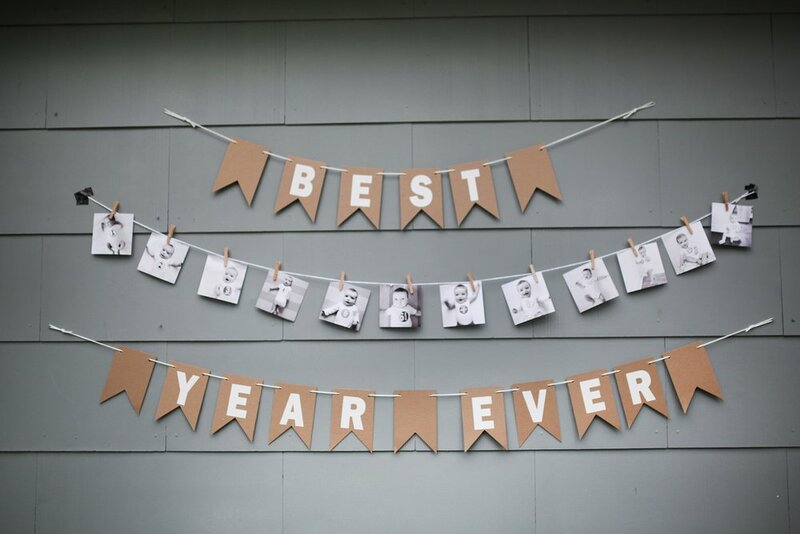 The chipboard bunting strands with letters were another quick DIY. Chipboard bunting from Hobby Lobby and a couple packages of 3" white letters, also from Hobby Lobby. I'll pack these away for future celebrations. I attached the high chair skirt to the tray with command strips, which honestly didn't work very well, so there was also a lot of duct tape involved. The letters and number ones are from Hobby Lobby or Michaels. I went a few times and grabbed letters when they were on clearance. I love that I can reuse them for future parties. 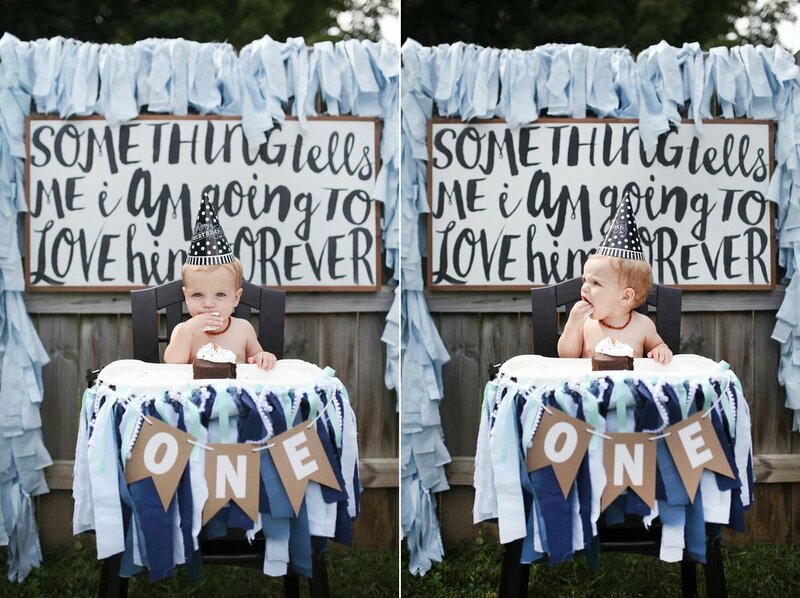 I can swap out the blue letter "n" in "one" for a pink one if we have a girl, for instance. Reuse, reuse, reuse! The blue berry baskets to hold apple slices are from Shop Sweet Lulu. So are the wooden utensils and little glassine bags to hold them. Paper plates, cups, napkins, balloons and party hats from our local Party City. Other than that, I used a lot of "decor" that is just hanging in our home. The sign behind the high chair hangs above Xavier's crib. The photo frames were also hanging in our house, and I printed a few extra photos of Xavier to display. The potted plants are from various rooms around our house. Shop your house to pull together items to display - I bet you have more than you think! If you have kids or babies coming, set out a basket of toys for them to play with and lay a blanket down on the grass. The little ones loved playing with Xavier's toys and it let parents relax and chat! If you have a fence or garage, utilize that for decorating. This worked so well for Xav's party. We used the side of the garage to hang the garlands and bunting and photo frames, using nails that were already there. 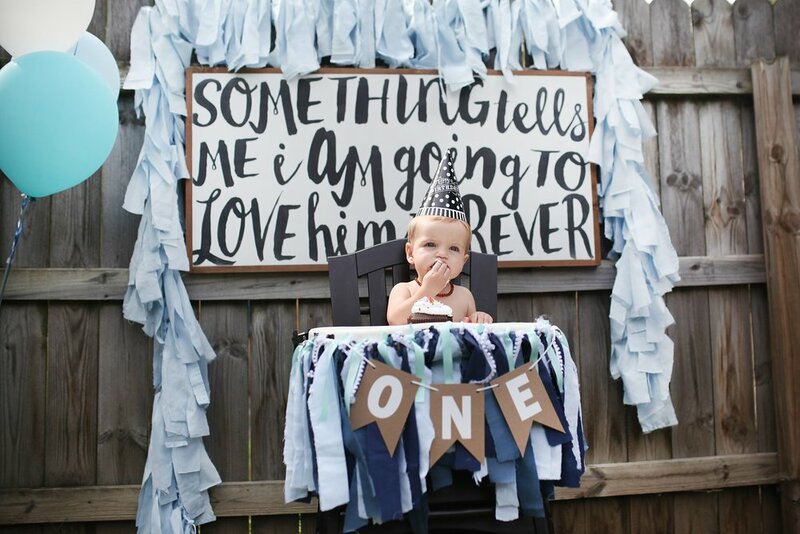 We hung the sign behind the high chair on two nails in our fence, and draped the blue garland overtop. For outdoor parties, use fans to keep bugs away. We didn't have a strong enough fan, but having a small tabletop fan on the food table and a larger box fan in a corner will keep yellowjackets and bugs away because they don't like the wind. 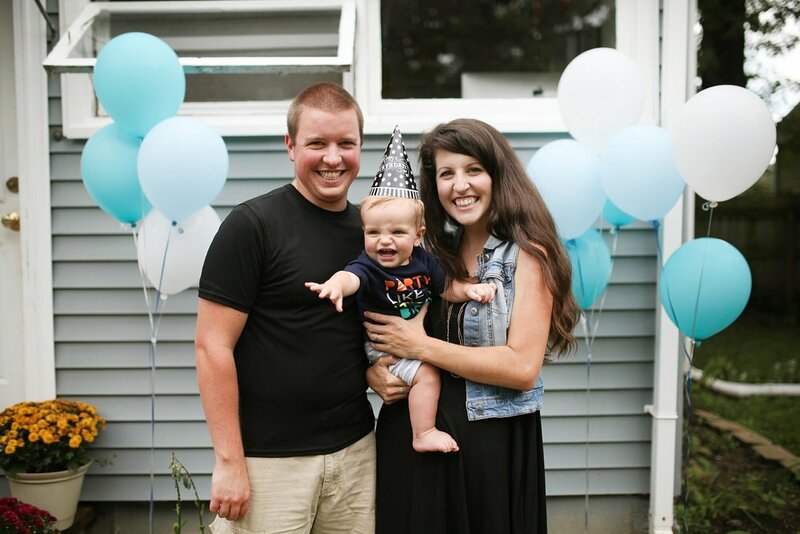 If you want your baby to wear a party hat, practice! 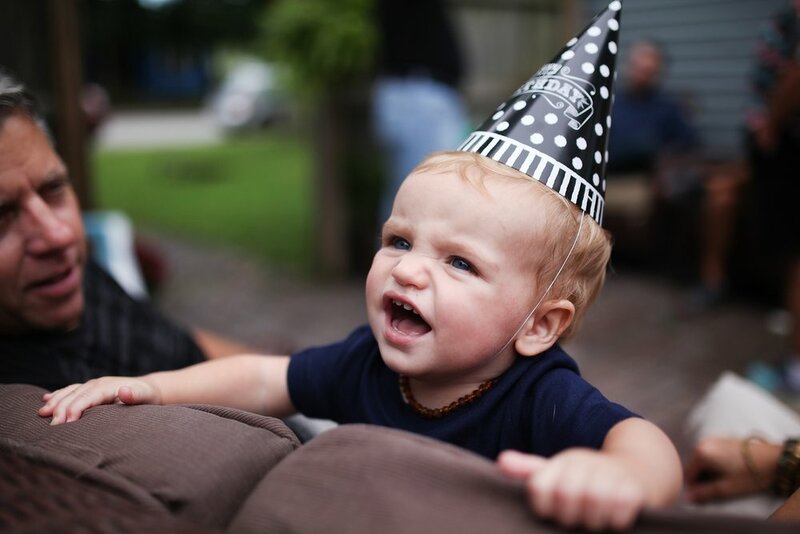 I know this sounds ridiculous, but Xavier wore his party hat the whole time because I put it on him several times in the weeks leading up the party and he was used to it. 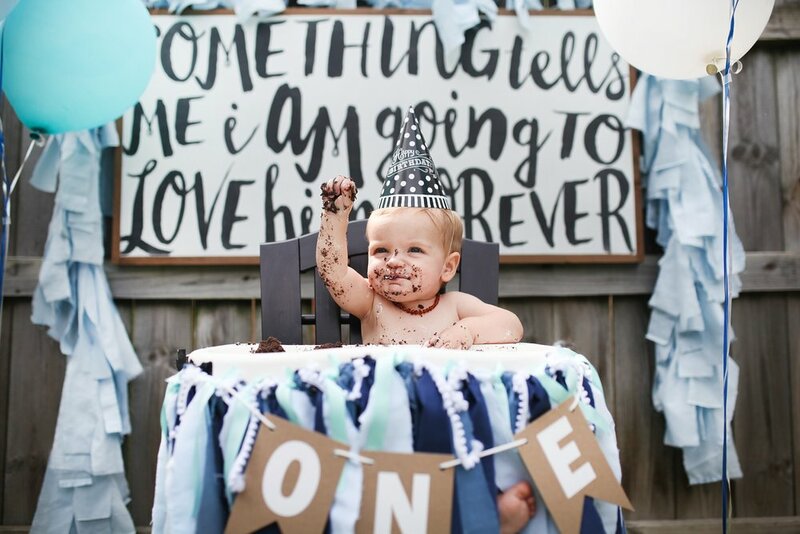 We had so much fun celebrating our sweet baby boy and are so grateful to have this village alongside us as we journey through parenthood! Y'all! My mama and bff Haley threw me the CUTEST baby shower this past weekend. 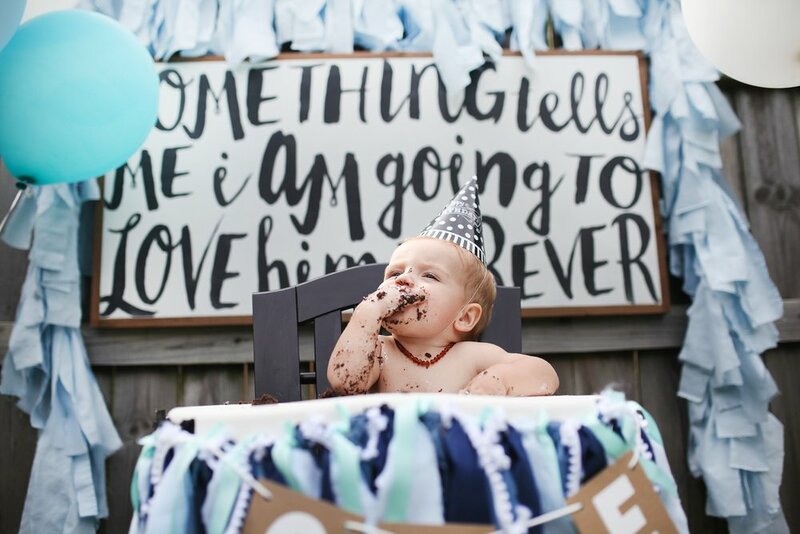 Originally I wasn't going to go with any sort of theme, but once I found out we were expecting a little boy, I went all-out themed goodness. The shower was at my parents' house on a lake, so we went with a nautical theme and I have to say, I'm pretty obsessed with it! My BFF Chelsea designed the invitations, which were TOO cute for words. I know, I know - I'm a stationery designer, why not design my own invites? But Chelsea created my bridal shower and bachelorette party invites too, so I guess it's now officially a thing: she designs the paper goods for my life events. Hope that's cool with you, Chels! We did our registry through Babylist, and I can't recommend them enough. They are AMAZING. We were able to add products from any website we wanted, including Amazon, Etsy and cute little boutique stores, and gift-buying was super easy for guests. I can go in and download a spreadsheet of who bought what to make thanking people a breeze, AND they sent me 75 of these insert cards totally free!! So great. 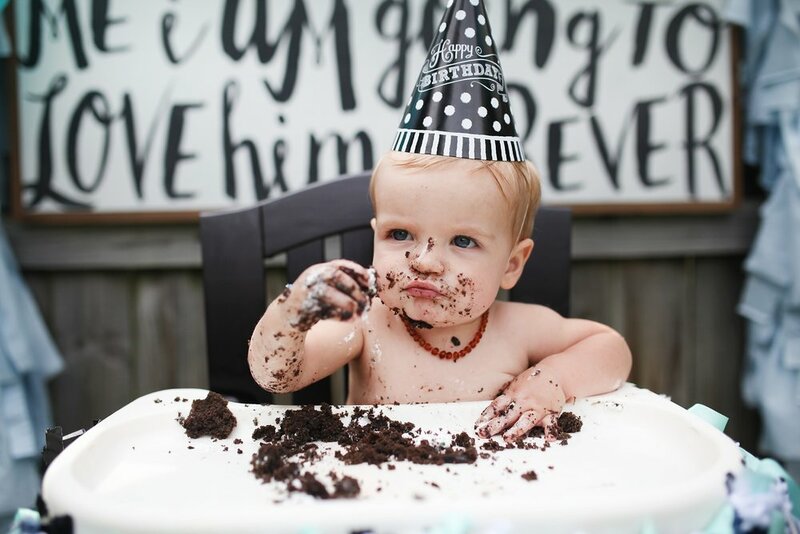 Make your registry with Babylist, mamas. Seriously. 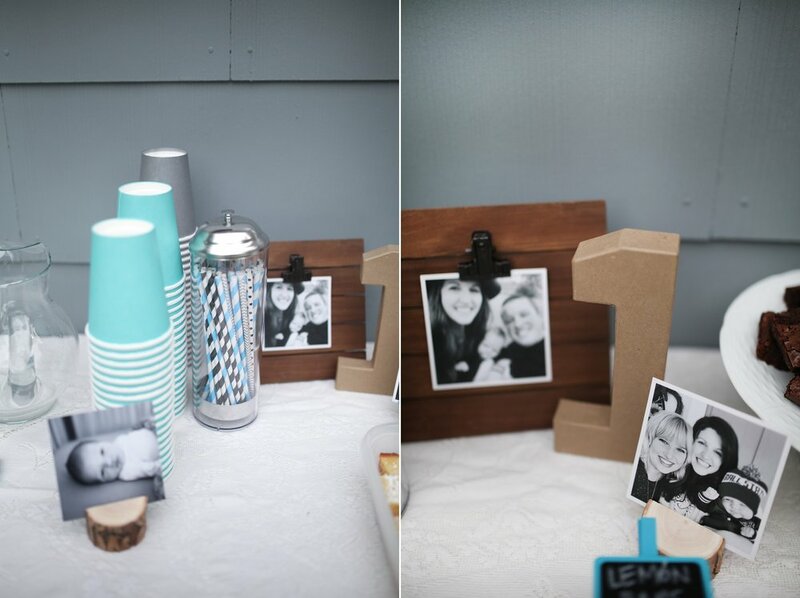 I whipped up the matching decor pieces based on the super-cute invites Chelsea designed. We had a few do-on-your-own-activities, like filling out the baby prediction sheet and writing out a wish for the baby. Reading the predictions was hilarious and I can't wait to see who guessed closest! And the wish cards are a perfect size for tucking into a baby book. 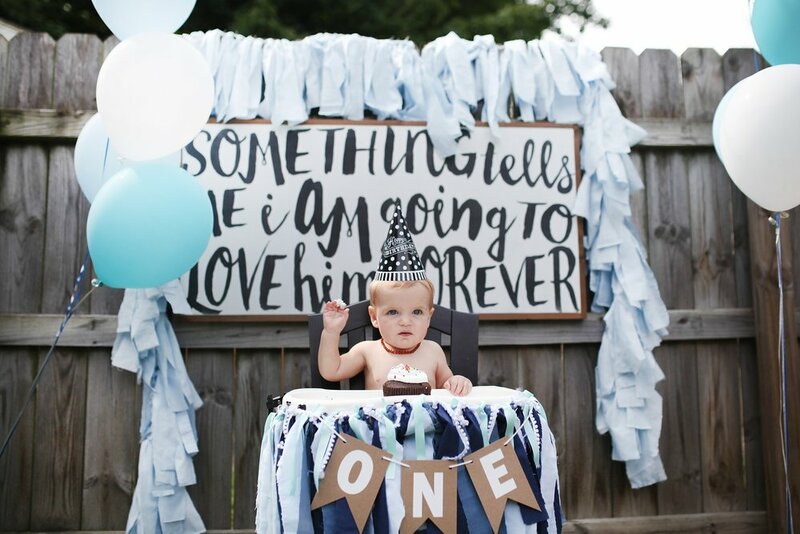 Such a sweet keepsake! We also did a diaper raffle, which was fun. The invitation had a little tag included, instructing people to bring items from the "diapering" section of our registry to be entered to win one of two fabulous raffle prizes. I've seen this done a lot with packages of disposable diapers, so I figured, why not tailor it for our plan to cloth diaper? 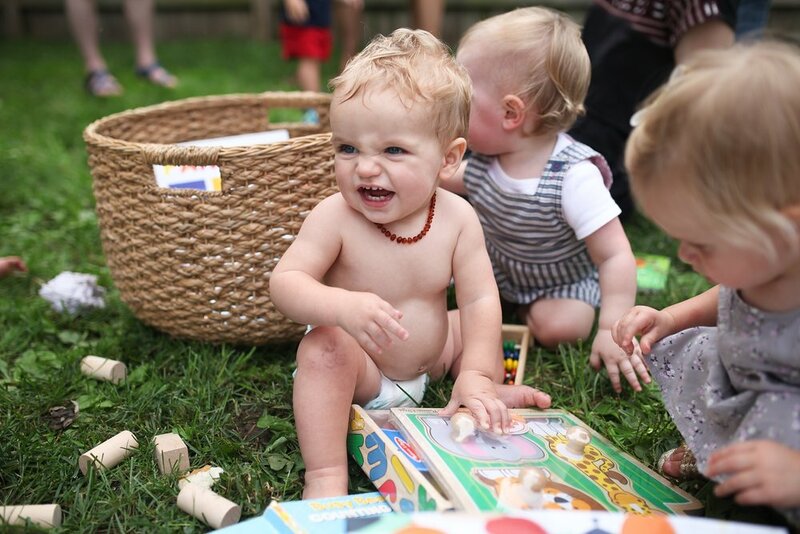 We ended up with some sweet cloth diapering supplies and two lucky guests won some lovely gifts! We went low-key with food and just had a build-your-own-sundae bar, with brownies as well. Drinks were punch, lemonade and water. It was 105 degrees with the heat index on Saturday, so it was perfect! We decorated the inside and the outside porch area, since people ate, talked and mingled inside and outside and floated between the two spaces. Between my mom's love for nautical decor and my love for all things outdoorsy, we actually had quite a lot of the decorations just laying around. 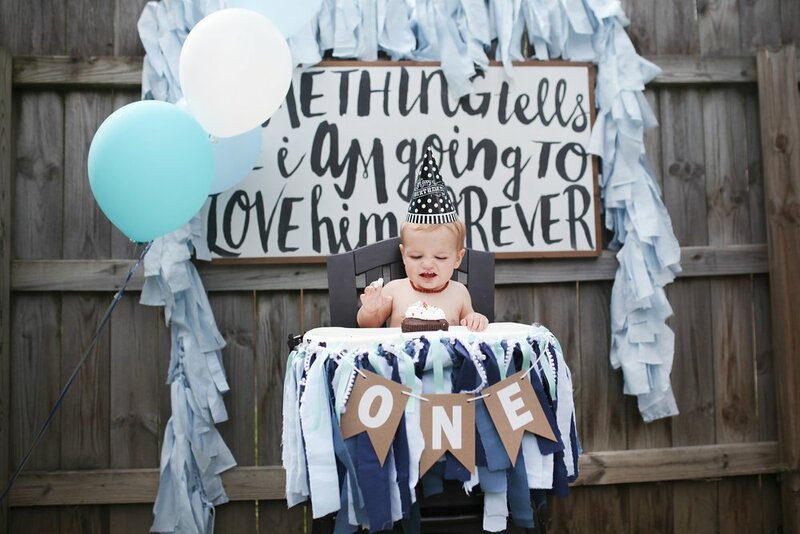 I did make the nautical bunting and the "oh boy" bunting, as well as a few cute "ahoy it's a boy" signs which were framed and set around on tables. I also went all Pinterest-y and made that wreath. For centerpieces, we tied striped twine around mason jars and added a white lifesaver to look like a life preserver, then filled the jars with white flowers. The flowers served as the game prizes, too! Overall, the decor was pretty simple - paper bunting, a tissue paper garland I already had, helium balloons in shades of blue, a few framed photos of me + Matt through the pregnancy (I just used frames and clipboards we already had), and then the nautical-y knickknacks like the driftwood, lantern and such. Can you believe we found this lighthouse at Goodwill for $2? So great! Hooray for up cycling. Chelsea also hand-lettered two chalkboard signs which were SO cute. She lettered signs for our wedding too - over two years ago - and I couldn't bear to erase them until I needed the chalkboards for the shower. So I'm sure that these will remain exactly as they are, safely tucked away in our attic until I need them again for another party someday. I opened lots of gifts from loved ones and we oohed and ahhed over the cutest baby clothes. I feel incredibly blessed by all the love that was truly "showered" on me, Matt and the baby and am SO grateful to my mom, Haley (and Chelsea!) for making this shower a dream come true! Now I'm working away on writing all the thank-you notes - but having super cute ones definitely helps! Are any of you in the market for baby shower decor? Did you have a themed shower? I'd love to hear! XO! **All of the printable shower decor I designed is linked throughout the blog post. The printable PDF files are for personal use only, please, and cannot be resold! If you use any of the goodies for your own celebrations, be sure to snap a photo and hashtag #prettythingsforhappypeople on social media so I can see them in action! If you want to download all of the files at once, you can do so right here.